Sweet potato French fry side dish is delicious and filling as well. I have eaten plenty in restaurants around my state. But, recently I decided to buy my potatoes to fry at home and since I didn’t have a cutter, I decided to use a knife. This is not only exhausting but also messy. It’s easier to work with a French fry cutter since it saves so much time. Besides, the cutter will help you in other uses like cutting veggies. You will also have nice and neat shapes of sweet potato chips when you use the cutter. I am thinking that you are the one who loves potatoes like me, here are some of the potato recipes I feature. By now you know that you can find the restaurant style potato sticks or varied wafers at home just like in restaurants. For better results make the potatoes shapes uniform. 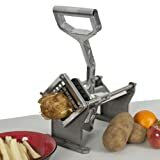 You can use this to cut your potatoes into the French fry potato shapes. You press a single lever and the potatoes are forced to come out in the desired uniform shapes. This cutter cuts your potatoes in thin disks and they assume a waffle pattern. You can use it at home or in your food establishments. You see, when you use a knife at home to make potato wafers, it’s never easy to make them all crispy because they lack the same thickness. But, with the waffle cutter, the potatoes are bound to be crisp. I know most people who love those spiral potatoes but have never thought of making them at home. They believe the chefs in big establishments use some magic cutting style to come up with the spiral chips. This isn’t always the case. You don’t have to struggle with the knife at home you can buy the spiral cutter for these potatoes. This is for your regular chips. They don’t have a different design they are just the normal kind of chips you find everywhere. This slicer works like a mandolin. It produces the equal design and thickness of potatoes. They maintain the traditional taste and uniform size. What happens when you need the crinkle fries? Use the crinkle cutter which isn’t mechanized. They are the manual cutters. The cutter has a crinkly blade that will give your potatoes a wave-like pattern. The sweet potatoes are quickly gaining popularity across America because of their health value. Most people opt to use them in place of the Irish potatoes. But, unlike the Irish potato that is light and easy to cut, the sweet potatoes are dense, thick and harder. You must use more power to cut the potatoes when using a manual cutter. Never use a cutter that isn’t meant for a sweet potato to cut the sweet potato because they will spoil them if you force the potato in. Most sweet potatoes cutters are heavy duty. To cut the potatoes assuming you are using a manual cutter, wash the potatoes. Soften the potato in the microwave for about a minute if it’s medium size and 2 minutes if it’s large or cut the edges and place it in your machine. Place one potato in the manual cutter and a bowl on the other end to collect the cut potatoes then easily push the potato into the blade. However, if you have a heavy-duty automatic machine then this will be easy because you only need to place the potato in the machine and the cutter does the rest of the work. Note that, there are alternatives to manually cutting the sweet potatoes with a knife but the process is way time-consuming. Also check Best Potato Ricers. The fact that it’s from a trusted brand of cutters gives it a win. With this cast iron cutter, you can make your own restaurant-style French fries. It works when you place the potato on the press then easily push it down. This is one of your best cutters in the market today that has removable blades. You can switch these blades to cut your fries to the desired thickness. For many people, this design looks commercial though it’s not. They make cutting pounds of potatoes easy. All its parts use stainless-steel material then the outer body uses cast iron for a sturdy construction. This also makes sure you have the consistent easy to cut potato fries. Its suction cups further help to make the work easy when you need to use on the countertop. When you are using it for your sweet potato, always make sure you cut both edges before placing on the press. Some people prefer to heat the potato for a minute to 2 over high heat. This features a cast iron, heavy duty machine that is rust free and sturdy in construction. The cutter has a 3-blade option (¼, ½, 3/8) inches and a push block. 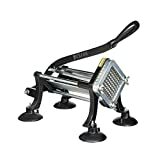 It’s easy to use because you only need to place your potato on the press between the push block and blade then push it. Its long handle gives you a good leverage when cutting the sweet potato fries. It has suction feet that helps when you need to mount it on the counter for easy use. It further prevents the slipping of the cutter when you are using it. The suction feet are removable for easy storage after use. For stability, you receive four screw holes for easy mounting on the wall counter or cutting board. The efficient cutter makes work easy and cleaning it is easy. Disassembling and reassembling it is a breeze. Although you pay a lot of money, this cutter only gives you the ½ inch blade the rest you must pay extra. This makes it an expensive option because sometimes you may need different thickness for your potatoes. Rest assured that this beautiful design will fit into your home décor. What an attractive design of sweet potato cutter. It features a heavy-duty, cast-iron material with its strong steel rod. Regardless of where you are using it at, this item has the leverage and power to take on those chunks of potatoes. 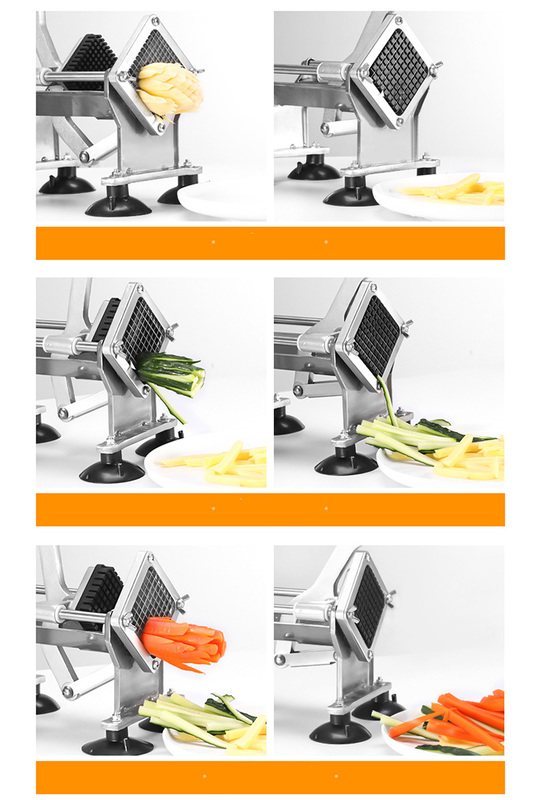 Whether you need to slice your sweet potatoes, carrots, zucchini, veggies, vivo cutter should be your top priority. To avoid sliding, the cutter has suction cups that hold it on the surface. The best part is that cleaning it is easy because it takes minutes to disassemble and assemble the parts. You only clean it using clean soapy water then sanitizing it. It cuts your French fries in a uniform size of about ½ inch. This is regardless of whether you are using it to cut the tough sweet potatoes or yams. Using it is as easy when cutting Irish potato as when cutting sweet potatoes. On the downside, the blade given to you is only ½ inch and if you need other thicknesses you must buy other blades aside. It’s also considered heavier than most cutters. Nevertheless, it’s extremely powerful when it comes to cutting your potatoes. Its glossy red design makes it attractive and suitable for any kitchen design. In fact, if you can mount it on the wall to act as your focal point. Here is your other best choice when it comes to cutting sweet potatoes. The sturdy construction can stand on the counter or you can mount it on the wall with the screws given. It’s light in weight which makes it portable. The heavy-duty item makes French fries from sweet potatoes or Irish potatoes and you could use it to cut zucchini. It has a ½ inches and 3/8 inches blades to make both regular and thin French fries. This high-quality item is made using high-quality stainless-steel metal which means it’s durable. The machine is not only easy to operate but also to clean. This is because it’s easy to disassemble and assemble. Its storage is equally easy because it’s small and when mounted on the wall its color and design may act as your focal point. It’s steady and easy to use by both kids and adults alike. When it comes to this cutter, you are offered a full package of durability, affordability and stability. It guarantees you some great year of service while finishing your tasks in minutes. It’s a heavy-duty item that has a cast iron body and stainless-steel rod. It has suction feet to offer stability as you work on your potatoes. You also have the choice to mount it on the wall/countertop for convenience. You will never go back to the knives when you use the cutter because of its uniform outcome. It looks like a simple design but its performance is that of a commercial grade establishment. The storage of the item is also easy because you can separate the feet and store it differently. When using it, place the potato in the V-shaped trough then pull the handles to press the potatoes. This will give you the restaurant grade of potato cuts without effort. All you need is a single push. This one features a rudder design leaver that eases the cutting process of the potatoes. 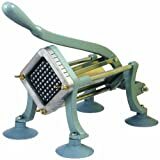 It has sturdy legs and a solid pedestal for stability as you operate it. Its suction-cupped feet prevent sliding while holding onto the surface. It’s safe and efficient in design which makes it easy to operate. You can use it for other purposes which include cutting veggies, and fruits. 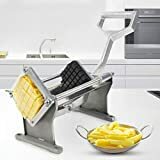 It offers you a choice of ¼”,1/2” and 3/8-inch blades which allow you to cut potato French fries, sweet potato French fries and different veggies. Its stainless-steel blades offer you the food security you need because it’s corrosion and rust free. You may use it both at home and for business purposes. It features an aluminum alloy material that makes it durable and sturdy in construction. Since it has various specifications, this will definitely meet your demands. The item features a strong iron body with an aluminum alloy handle and stainless-steel blades. This assures you that the item is corrosion resistant. The different inches blades allow you to cut the potatoes, sweet potatoes and veggies into different thickness and sizes. Moreover, you may use the round blade for cutting the apples or making wedges. Its sturdy handle eases the cutting process while protecting you from any cuts. 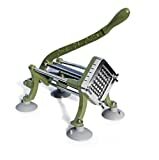 Its sturdy legs provide stability when you are working on your potatoes. The cutter also occupies less space in your kitchen and would even suit those with small kitchens. If you have a food processing industry, this will suit you. You may use it to process your business food items. With its sturdy construction, cutting your sweet potatoes to different designs shouldn’t be an issue. This is certainly another best choice for sweet potato slicing. Its heavy duty as you can see which suits the commercial use. This will allow you to enjoy the restaurant design French fries without consuming your time. You can place it on the counter or mount it on the wall if you wish. It has a strong stainless-steel material with a sturdy handle for easy operation, especially when working on your sweet potatoes. It’s rust-resistant and durable if well maintained. It features 4 French fry blade size (¼, ½, 3/8) inches and the fourth blade suits veggies and fruits like apples and oranges. It’s designed to deliver the same cut sizes and it’s easy to clean. Unlike other cutters, this is small which makes it easy to store. Before you begin to use it, always clean the blades and unit. It can cut the sweet potatoes but you must use a lot of effort. To be safe, partially soften the potatoes in the microwave before you begin cutting. What potato will you cut? Choosing a cutter that will comfortably cut your sweet potatoes is a good idea. There are cutters for different kinds of potatoes. Make sure you choose one that is either multipurpose or works well with the sweet potatoes. There are also different cut types from the wedge, straight, curly ribbon and the different cutters can cut different shapes so, it’s upon you to choose. Do you want a heavy-duty or standard cutter? 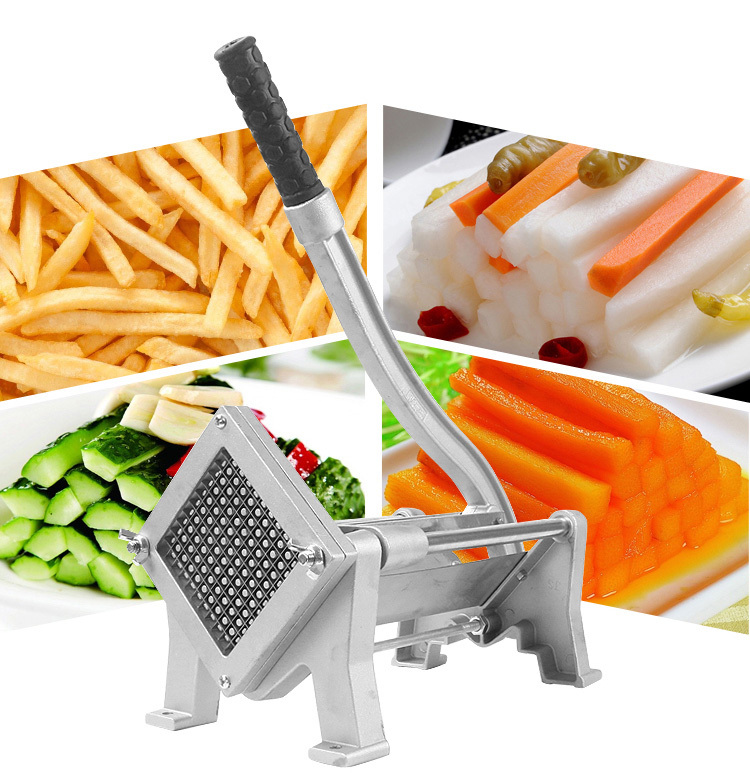 A heavy-duty cutter will serve you if you hold parties at home where you cut the French fries or you intend to use it in large food establishments. The ergonomic design will stand the mileage you put on it. For more efficiency, choose an automatic heavy duty especially if you use it in large establishments. The standard cutter suits you if you rarely make the sweet potato French fries. They are easy to use yet they produce a reasonable number of French fries. For portability, mount them on your wooden cutting boards. Automatic cutter, on the other hand, will suit business that produces a lot of French fries in a day. This may include big restaurants, fast foods, big cafes among others. They save massive time by using the electric power or air cylinder to cut the potatoes. There are several thicknesses when it comes to cutting the French fries. This you will only notice if you have ordered French fries in various restaurants. You can have skinny and long French fries to thick wedges. It all depends on the blade you are using to cut your French fries. The good thing is that most cutters offer the different blades cutting sizes. 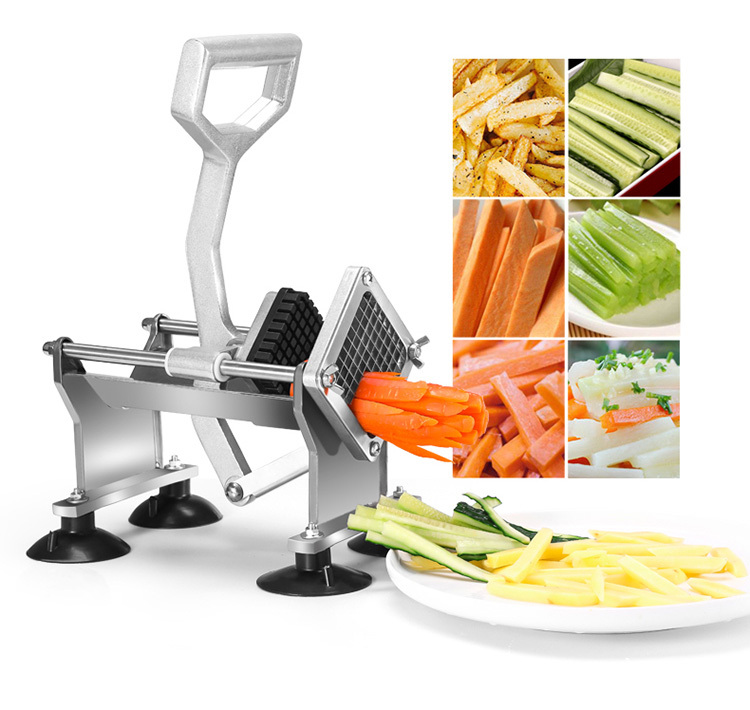 Aside from cutting your sweet potatoes, the cutter is used to cut other regular potatoes, vegetables which include cucumbers, tomatoes, carrots and other fruits. However, not all potato cutters can cut the sweet potatoes this is because sweet potatoes are thick dense and hard to cut. Check if it’s a sweet potato cutter. You can do it when you pair the correct blade set and push block from your cutter’s manufacturer. It’s easy to change the blade size from cutting ¼ inch straight cutter to a 6-inch wedge cutter. Consider companies that offer you an already blade set and push block. What material has been used? The material used to construct the blade is essential. With this, you will know whether it’s durable or not. Always go for cutters made using stainless-steel or cutter iron. There are different kinds of blades for cutting different sizes and thicknesses of the potatoes. Ensure you choose the right blades to avoid spoiling your cutter. Especially when you need one to cut sweet potatoes, a stronger blade is inevitable. Moreover, check the sharpness of the blade to make sure you don’t have to sharpen it every time. Another question here is: is it easy to remove so that you can clean it? Because if you can’t clean it thoroughly your blade will develop some hazards. They say cheap is expensive and this saying is partly right when it comes to choosing a cutter. Go for the blade that offers you quality even if it’s more expensive. If you want to know the quality of the cutter, go online and read the customer reviews. Don’t base all your judgement on them but let the reviews guide you in making a right choice. Consider the cleaning technique as per the instructions. There are a few dishwasher safe fry cutters. Also, there are those that you will clean manually with warm soapy water, sanitizers and other detergents. It’s up to you to choose. If you have limited time or just don’t like cleaning utensils, a dishwasher-safe material will serve you. This is your guide to the best tool. Some are so confident that they give you a 100% money back guarantee. Nevertheless, other tools give you a period warranty to allow them to make it for you in case it gets spoilt. 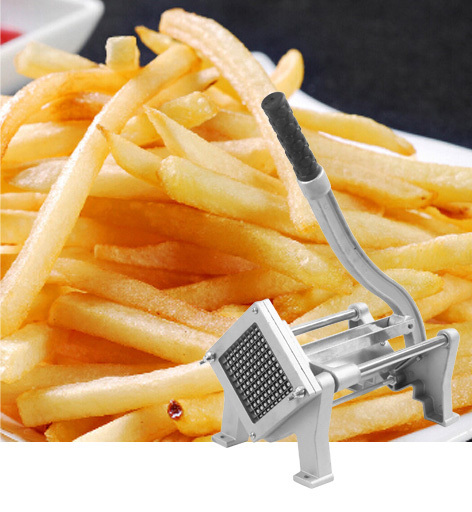 You should choose a French fry cutter with a sturdy construction and ease of use when cutting. The tool is safer when you trust that you can safely use it while delivering some clean cuts too. A good cutter whether for commercial use or daily use should be mounted on the wall. If you are using it at home, make sure it has the cup suction legs that keep it sturdy on the counter as you use it. It should be easy to remove from the counter once you are done. These aren’t the only best French fry cutters for sweet potatoes but, you may use it to guide you. The market is flooded with different cutters claiming to be the best but, to have a clear cut you must check its performance. 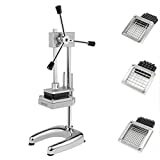 In my opinion, I say New Star Foodservice 42313 Commercial Grade French Fry Cutter is the best compared to others on the list. This is because it offers convenience with its competitive price and restaurant style sweet potato French fries.